Video games are better with wind effects. Vortx is a ridiculous machine. On the surface, it's a $120 desktop fan — a bulky black box with a hole in the front that blows air at people's faces as they play PC games or watch YouTube videos. However, things get much more interesting on a software level. Vortx responds to whatever is happening on the screen, blowing warm air in reaction to explosions, gun blasts or flames, and room-temperature air in the case of skydiving on a clear day or snowboarding down a snowy mountain. It's a unique immersion device built for an era when game developers are pushing at the edges of escapism from every angle, with every human sense. The most impressive promise behind Vortx is that it'll work with every game, every YouTube video and any piece of media, as long as it includes both audio and visual action. Vortx lives up to this description — in fact, it works a little too well. Before diving into how it performs, let's break down how Vortx actually works. Vortx comes from California-based company Whirlwind FX and it runs on the EX algorithm, which relies on just two inputs: audio and visual. The software uses these dual veins of information to output warm or cool air at the proper times. Vortx divides the screen into quadrants and tracks the colors in each region; if there are a lot of warm colors, like orange or red, the machine prepares to expel hotter air (up to 99 degrees Fahrenheit). If there are cool tones, like blue or white, Vortx is primed to blow room-temperature air. But, it'll only do so if the audio cues tell a similar story. "An explosion has a specific sort of booming bass sound to it," Whirlwind FX head of software Matt Gilg told Engadget. "Or sky, if you're dropping in, has that sort of whistling sound. So, if those two things match, we send a trigger. 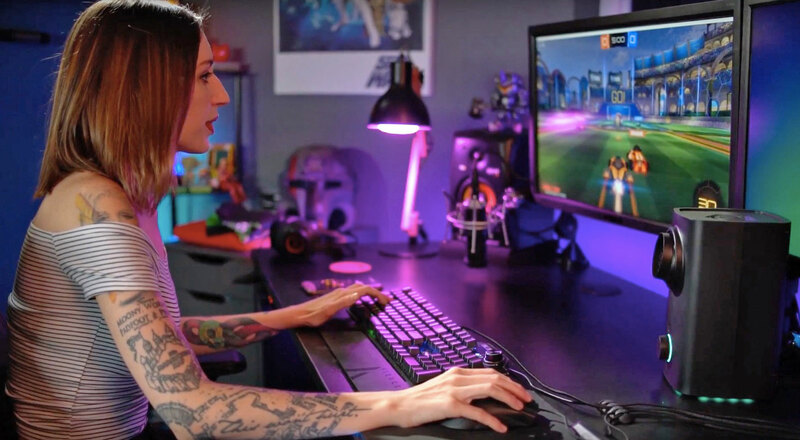 If those things don't match, like if your mouse goes over an orange door or you're in an environment that has a color palette of an explosion but the sounds don't match that, we know not to trigger." Essentially, the EX algorithm turns the fan on when lots of noise and distinct colors hit the screen. It's a clever system. However, in practice, its cracks are obvious — as it stands, Vortx doesn't actually know if a flash of red and sound is an explosion or a mall Santa letting out a robust, "Ho ho ho!" Audio and visual cues can only tell an algorithm so much. And oftentimes with Vortx, it's too much. 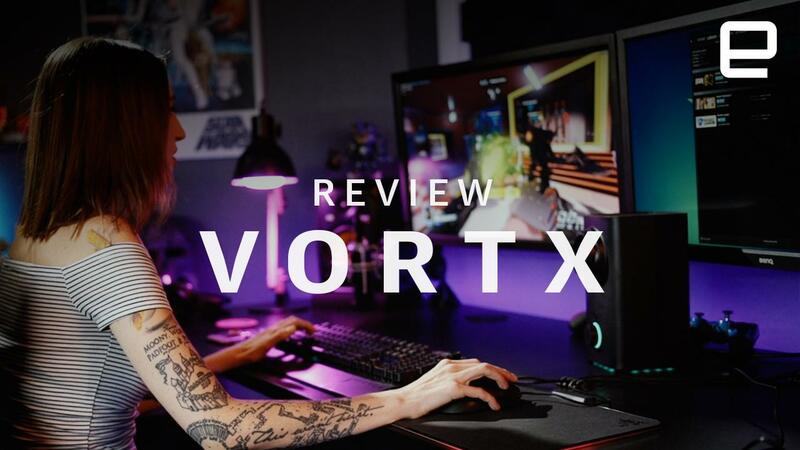 Vortx works best with first-person shooters, battle royale and action-adventure games, and it's truly a joy when everything lines up and the air that hits your face matches the on-screen action. For instance, flying around as D.Va in Overwatch is wonderful with a cool breeze added to the mix. Playing Rocket League feels fantastic when a gust of wind picks up just as you hit the boost and dive in for a goal. However, it gets a little old when you're driving around the field, constantly picking up speed and feeling a steady stream of air against your face. At this point, Vortx turns into little more than a desktop fan. That's not a terrible thing, but it's also not particularly immersive. Vortx reads heat signatures well, performing solidly with a game like Doom, which features a near-constant flurry of fiery explosions. But when things get hectic and hordes of bassy, flaming demons rush the screen, Vortx tends to respond with a steady flow of hot air. This doesn't feel quite as refreshing as the cooler air -- but hey, it is Hell, after all. When Vortx works, it's a fantastic treat. 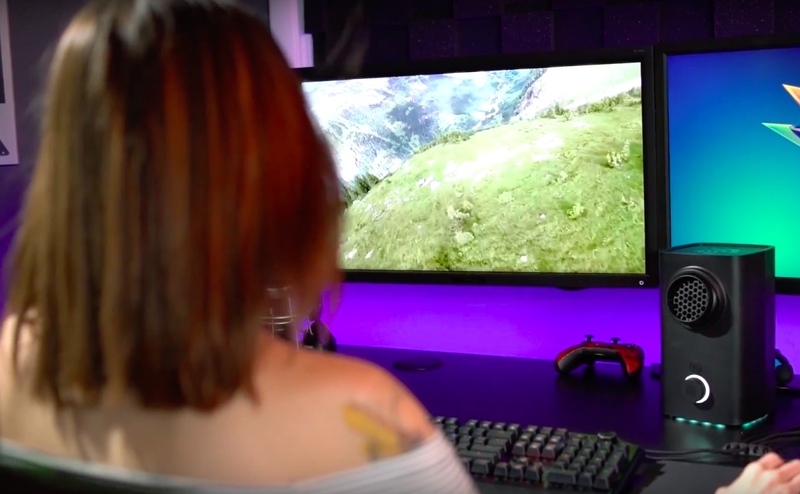 It adds a layer of sensory delight to YouTube videos of people flying over mountains in wingsuits, for instance, and it somehow makes K-pop music videos even more addictive. These videos tend to have a ton of bright colors, sharp movement and distinct bass lines, making them ideal subjects for the EX algorithm. However clever the EX algorithm is, it's also fairly crude. Vortx has trouble operating when there's a lot of action on the screen, and it sometimes reads things as speed or heat when they're neither, expelling out-of-sync gusts of warm air. Developers promise the algorithm will improve over time in response to user feedback. As more people get their hands on Vortx, the team will fine-tune the algorithm and update the machine for all owners along the way. Vortx just started shipping in September. "We're not perfect today," Whirlwind FX founder Timothy Sun said. The Vortx team sees the current machine as a first step, proof that developers can use existing inputs like audio and visual cues to create more immersive experiences. "Just looking at audio or colors on the screen is not enough for a good experience." Sun initially tried to sell Vortx as a bespoke accessory, where content creators would have to code its wind cues into their games or films. He took a prototype to the Game Developers' Conference, but no one was interested enough to actually spend time coding wind immersion into their projects. He realized he needed a solution that would simply work with any game, and that's when Gilg entered the picture. Together, they started tinkering with the idea that audio and color could direct the intensity and temperature of a fan. This inclusive, no-extra-coding-required solution became the fundamental idea behind the Vortx. "Just looking at audio or colors on the screen is not enough for a good experience, but there's still more to go," Sun said. "I feel like, at this point, it's good enough for our launch, shipping the product. But, in the future, I'm actually really excited about the potential because there are more opportunities that can be explored besides just wind and heat." Vortx is the beginning for Whirlwind FX, and it's a solid start with plenty of room for improvement — and, eventually, evolution. "There are a ton of products out there that kind of suffer from a similar problem, which is, I don't want to script it for every experience because that's just a lot of work," Sun said. "That's where I'm very excited about the potential, being able to expand it out from a software perspective to other hardware products or triggering of anything."